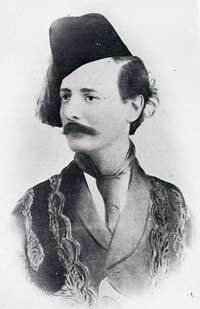 Robert Hay was a Scotsman who arrived in Egypt in 1824, aged 25, having recently inherited the family estate of Linplum. He employed a team of artist and architects to record the monuments, art and artefacts of Egypt. This group at different times included Joseph Bonomi, Frederick Catherwood and William Lane. Robert Hay was a colleague and friend of Gardner Wilkinson, artist and antiquarian who lived for many years in a tomb dwelling with extensive outbuildings on the hillside of Sheikh Abd el Qurna. Hay lived and worked in Qurna for extended periods over many years, residing at times with the Wilkinsons or in a vaulted granary in the Ramesseum or rooms in the temple at Medinet Habu or a tomb in the Valley of the Kings. He became a meticulous draughtsman and demanded long hours and very high standards of accurate recording form his multi-national team. The vast collection of drawings, paintings, plans, notebooks and diaries was never published and is now in the British Library in London. It is often consulted by Egyptologists and scholars wishing to see tombs, temples and wall paintings in a less deteriorated and damaged state in the 1820's. Robert Hay made a number of detailed drawings of the whole area of Qurna, including two stunning 360 degree panoramas. The drawings were made with the aid of a camera lucida - a portable device with prisms that enables exact drawings to be made of scenes and objects. The drawings are part of a huge collection, collectively called The Hay Manuscripts, which are mainly of Egyptological interest.